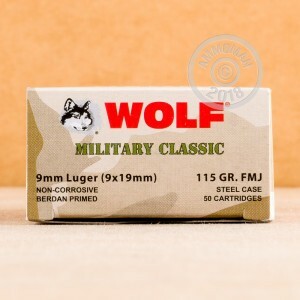 Wolf ammunition offers affordable range loads that give you more trigger time for your dollar than most other brands. This 9mm Luger load is an excellent choice for training with your concealed carry handgun. 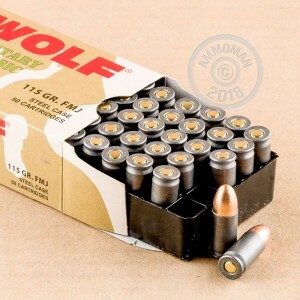 Each round in this box of 50 fires a light 115 grain full metal jacket bullet. This is a standard pressure load that will work well in compact pistols. 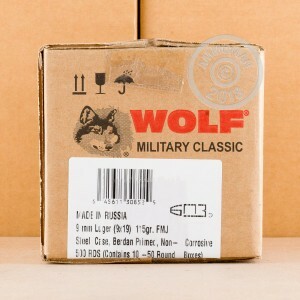 This ammo is made in Russia and uses non-corrosive Berdan primers and non-reloadable steel cases.